You know what I’ve discovered that does NOT work well for me? Coming up with discipline strategies and consequences on the fly. It’s hard enough to remain calm when the kids are disobeying or otherwise driving me crazy. But there’s no way I can think up an effective discipline idea and then implement it while staying calm and rational. Reactive parenting does not work! It really should be called “over-reacting parenting.” Nothing makes you overreact like a screaming 2-year-old, a pouty 4-year-old, a disobedient 5-year-old, and a sassy 7-year-old. It’s really helpful when they are all acting up at the exact same time! Usually Punkin is crying too – I never know if it’s in sympathy with her siblings or she’s sympathetic to me who has to listen to and deal with them. Either way, it’s sympathy crying. When I walk into a discipline situation with no plan, I either dole out a punishment that is too harsh or the consequence is just plain irrational or unenforceable. Ever issued an empty threat? “Do that again and you’re never going to leave your room again! EVER!” Of course you don’t mean that, but the kids have pushed all your buttons and you’re just done! So very very done! I don’t want to be the parent who issues empty threats and comes up with ridiculous discipline ideas. So, to keep from being caught up in the moment, we’ve created a chart of household rules. This chart not only has the rules, it also lists the consequences for breaking those rules. I have it copied on cardstock and placed strategically throughout the house. And since I’ve started using it, the kids are more cooperative and I’m more consistent. I am disciplining them on a regular basis when they break the rules and they know the boundaries and consequences without me issuing thousands of threats and reminders. The best part? I am so calm! Yes, I just walk up to my chart, point to the rule, read it aloud, and then read the consequences. I can almost blame the chart for the consequences that I give out. “Our rule is this. Doing that broke the rule. Therefore, the consequence is this.” It’s so easy and so effective. I don’t have to even think. Can I say how grateful I am that I don’t need to waste brain cells on coming up with ways to discipline my kids when they do crazy-strange disobedient things? 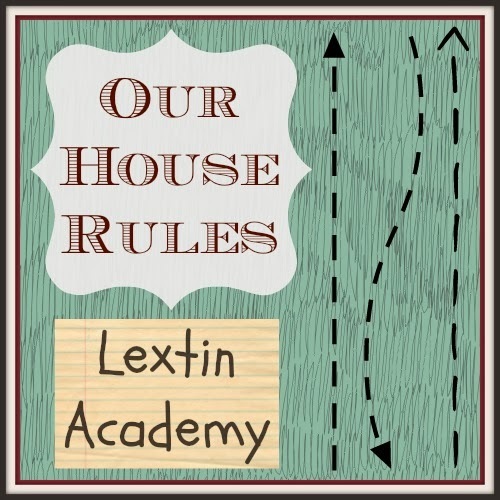 For our chart, we’ve kept our household rules very very simple. We used short phrases so that the kids could easily memorize them. The rules are fairly broad and the kids have been reminded of what actions are considered rule breakers. The second column has a Bible verse that we are memorizing as a family. The verses reinforce the rules. The third column is the discipline strategy. That’s where they can see what the punishment will be. The last column is the training column. We don’t want to just discipline our kids for wrong behavior. We want to teach them what is the right behavior. We want to have them practice how they should respond. Have the right attitude – Having the right attitude applies to whining, complaining, and all the stomping, pouting, snorting, eye-rolling, sighing, and general grumpiness that can be directed my way whenever I ask them to do something. Speak gently – When you’re yelling, interrupting, speaking hatefully, or saying rude or hurtful things to someone else, you’ve broken this rule and you’re not taming your tongue. Act kindly – This is the no hitting, no kicking, no touching, no pinching, no grabbing toys, no tackling, no pulling hair, etc. rule. Extra chore – If my kids don’t obey the first time, I’ll just tack on extra chores. Each time I have to ask (or tell) my kids to do something, they earn an additional chore. These can add up quickly! I write them out on the whiteboard as I add each chore. Eventually the child sees the list grow and gives up with the arguing and disobeying. My house has gotten much cleaner as of late. Lose 1 toy to toy timeout – When my kids are a total grouch with a terrible attitude, I will take away one of their toys and put it in the corner of my room. They lose that toy for the day (and sometimes longer) for having a bad attitude. I give the toys back as rewards for great behavior or when I catch them doing something sweet or obeying the first time. Lose iPod for the day – My kids adore their iPods that are full of wonderful stories and audiobooks. Whenever they are in their rooms, you can hear the iPods blaring some story of princesses or pirates. If they are speaking rudely to anyone, I tell them that I will take away their iPod for that day. For any additional rude words, I just add days to the length of time that I keep hold of their iPods. Chair timeout – If they can’t be nice to each other, they can’t play together and I separate them. I set up chairs in different rooms and they get to sit in the chairs alone and be ignored for a time until they can cool off and come together and play without trying to kill one another. Sitting in those chairs and facing the walls while siblings are playing together is terribly boring to them. It usually doesn’t take much until they miss playing together. Yes ma’am exercise – This is like a form of Simon Says. In this game, I yell out commands like, “Eat 5 chocolate chips! Crawl like a crab! Run up and down the stairs! Growl like a bear!” They have to very cheerfully yell back, “Yes ma’am” and then go and do whatever crazy thing they have been asked. And they have to do it right away. Usually by the end they are much more cheerful and polite and ready to obey the first time. Verse memorization – After witnessing their terrible attitudes I have them work on memorizing Bible verses. The Bible tells us to think on positive things and that whatever is in our heart is what will come out of our mouths. I hope that by filling their little brains with Scripture, it will help them curb those ugly thoughts that slip out of their mouths. I am going to have my kids memorize the Scriptures from 100 Bible Verses Everyone Should Know along with any other verses that are applicable to their current struggles. Say 2 positive or encouraging things – If you’ve just spent time tearing someone down with your words, then you need to build them back up. I have the kids think of 2 positive things to say to the person who was the recipient of their unkind words. These things have to be kind things that are very specific. They can list a strength of talent of the other person, compliment them, or give a reason why they love that person. My kids need to learn to look for the strengths of others rather than being busy pointing out all the negative things they notice. If you look hard enough and think about it long enough, you can come up with a long list of encouraging things to say to anyone. Serve others – At our house, we don’t hurt others, we serve them. I want to teach our kids to have the hearts of a servant and look for ways to help each other. When they’ve hurt someone physically, they have to ask what they can do to help or serve that person. It’s pretty sweet to hear the things they think up to have a sibling do for them. It’s a humbling experience to serve someone else and do things that you might not choose to do, but the attitude of humility is what we’re aiming to cultivate in our kids. Here’s our current chart: I’m sure it will change over the months and I’ll add new verses as we memorize the current ones. But it’s nice to have a consistent standard for everyone in the house! I love this so much! I have a 2.5 year old and 15 month old and the listen and obey the first time with my oldest and be kind to your little sister have been our biggest battles lately. I think implementing this will help me from over reacting! Do you have any suggestions on good consequences for little ones? I'm not sure if doing an extra chore would have much of an impact on her.